New savings are in different forms again. 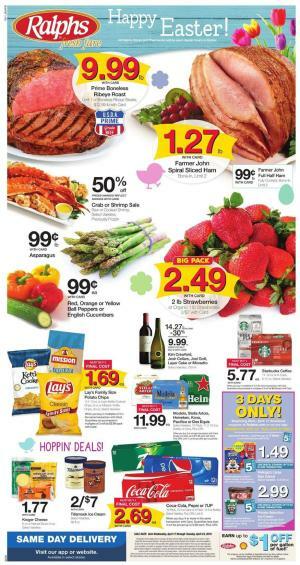 Ralphs Weekly Ad Easter Deals Apr 17 - 23, 2019 contains Big Pack deals, 3-days only sale, mix and match sale, 4x fuel points, fresh meat and produce, Passover food deals, and more are in the Ralphs Ad. The deals on meat and fresh fruits are interesting and profitable. Prime boneless ribeye roast is gonna cost only $9.99/lb. Use digital coupons up to 5 times. Kellogg's large size cereal costs $1.49. The deal is effective only for 3-days only. Shop for the beverage needs like Coke, Pepsi, or 7UP. Browse Ralphs mix and match sale that covers Gatorade, Pepsi, 7UP, Doritos chips, Pepperidge Farm, Red Baron pizza, and more items of grocery and frozen foods. 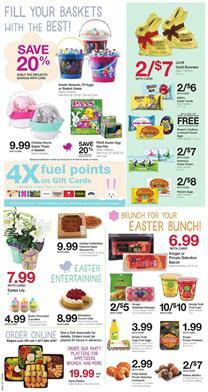 You can save a lot with the BOGO deals, multiple-buy savings, and 20% discount on Easter baskets. Earn 4x fuel points on gift cards such as Kohl's or Lowe's. If you like sweets in special days like Easter, browse crunch cake, cupcakes, party platters, and more on pg 3. Mix and match sale is a list of participating items that will get cheaper when you buy 6 of them. For example, Dave's Killer organic bagels will cost only $3.49 after a $.50 discount when you buy 6 participating items. In short, it's a "Buy 6, Save $3" deal. This deal covers many categories such as packaged frozen foods, snacks, beverage, and more. BOGO Free offers like Monster Energy drink is also available in this Ralphs Ad. Buy traditional Easter products like Holiday Home Easter plush-in basket for only $9.99! More traditional products like Easter eggs are in the range of Ralphs Ad. Easter sale covers Easter bunnies, too. Lindt gold bunnies will cost only 2/$7! Ralphs Ad also offers low prices for Passover. Check out all the products of the Ralphs Ad for Passover. Visit the preview of the ads to see the entire product range from the supermarkets. It's a very convenient way to save. Fresh meat and the produce are available on pg 6. Digital coupons, 10 for $10 sale, 4 days only offers, and more types of discounts are available on Ralphs Ad. Check out this Ad for 4-days-only sale on the first page. Buy Fresh ground sirloin to earn 3x fuel points. You can also earn $1 off per gallon. To see the details of that reward program, go to the official page of Ralphs. Check out the breakfast food deals as well. Kellogg's or Special K cereal will cost 4/$8! Make wonders in your kitchen and prepare a delicious dinner with the ingredients you can find on pg 3. Kroger Deluxe ice cream is gonna cost 2/$5! One of the best choices for a meal is pasta for me. Of course, it's a carbohydrate meal mainly, but a quick solution, too. Besides, it's one of the most delicious foods in the world with the proper sauce and additional flavor. Ralphs has Barilla pasta for 4/$5 on pg 3. Earn 3x fuel points with certain purchases at Ralphs this week. Hillshire Farm smoked sausage, Kroger shrimp platter, Simple Truth nuts are three nice deals that can get you 3x fuel points. Save $5 on packaged foods and meals. Quick meals are available on pg 3. Dreyer's ice cream will cost 2/$9 it's one of the participating items. Mix and match sale is a major discount range of products from the latest Ralphs Ad. Digital coupons, weekly discounts, and BOGOs are also the types of deals from the latest Ralphs Weekly Ad. Use digital coupons up to 5 times. One of the products you can buy with the digital coupon is Minute Maid orange juice. Earn 3x fuel points with many products from this Ad. Fresh Foster Farms chicken sale is a 3x fuel point and Ribeye steak is also the same. Having a great dinner, you might need your favorite soda. Stock up Coca-Cola, Pepsi, or 7UP for $2.99 ea when you buy 4. Save on Kettle brand potato chips and more items with the 4-day sale. It is only valid on Mar 28 - 31. Personal seedless watermelon is 2 for $3 discount this week. Earn 200 fuel points with your $30 purchase of pet supplies on pg 5. Basketball snacks are available, too. Buy Ball Park Franks with a BOGO Free deal at Ralphs. There is an extensive product range of 3x fuel points deal on pg 6. Boneless flip meat or Carne Asada is only $7.99 and it gives 3x fuel points. Fresh cut meat is available every day at Ralphs stores. Boneless flap meat for Carne Asada is only $4.97/lb on the preview of Ralphs Ad. Buy 5, Save $5 mix and match sale covers Breyers ice cream, Tide liquid laundry detergent, coke, Ritz. Find them on the first page of the new Ralphs Ad. 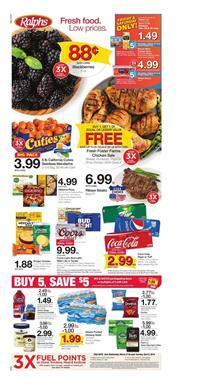 An extensive section of the Buy 5, Save $5 participating items is available on pg 2-3. Restock Coke, Dr. Pepper, Freschetta pizza, and more items with the 4-days only sale of 5 times redeemable digital coupons. You'll be able to buy Dr. Pepper or Coca-Cola for only $4.77! Some of the weekly ads have early Easter sales. This week you can save 50% on Easter home decoration and candies. Go to the official page of where these are available. Buy your game snacks for the prices of Ralphs. Pay only $4.99 for Fresh Lean ground beef, Ball Park beef hot dogs for 2 for $6! Bone-in or boneless chicken wings will cost $5.99 only. Also, find household products from the mix and match deal by Ralphs. Some chemicals, Cottonelle, Libman Freedom spray mop, Swiffer 2x refills, Glad trash bags, Clorox, and more are all on sale. 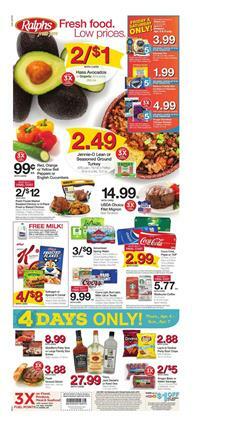 Shop for the best prices of Ralphs with using weekly ads. Subscribe to get emails about the future weekly ads.